The ST series full-automatic external brush washing machine is a kind of corollary equipment specialized for 5 gallon barrel water production line. The device employs hairbrushes to rinse the bottom, neck and body of the barrel all around, which largely improves effects of cleaning and also avoid the secondary contamination caused by manual washing. Besides, it also reduces work intensity of workers. This equipment is fully made of high quality stainless steel, which is corrosion resisting and easy to wash. Main electrical components are purchased from SIEMENS, Mitsubishi, and pneumatic components adopt imported AIRTAC products. This equipment is characterized by compact structure, high efficiency, stable and reliable operation, and high automation. Besides, it can be furnished with hot-water rinsing device and alkali rinsing device, thus the best cleaning effects are achieved. Founded in 2006, our company is a leading manufacturer and supplier of external brush washing machine in China. Here in Topling, we mainly offer bottled water filling line, juice filling production line, carbonated drink filling line and related equipments including decapping machine (cap removing machine), beverage mixer, shrink packing machine (shrink-wrappers), and other related machines. We offer installing and debugging services of our devices and staff training for factories abroad and OEM service. 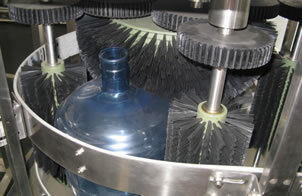 For more guides of external brush washing machine, please contact us.